Clinical Biochemistry, located in the Pathology block of the hospital, offers a high-quality analytical and clinical advice service to clinicians based at the Luton & Dunstable Hospital and surrounding area. Rapid analysis of a wide range of biochemistry tests is available on site and numerous esoteric tests are referred to tertiary centre laboratories. Staff are able to advise on appropriate requests and specimen requirements for more unusual tests and the Consultants in Chemical Pathologist and Clinical Biochemistry offer results interpretation, clinical liaison and advice on how to further manage the patient. Consultant advice can be obtained on a 24/7 basis. The department also houses and leads on the immunology and POCT services. The laboratory has full CPA accreditation and is approved by the Health Professions Council and the National School of Healthcare Science as a centre for training. Our Point of Care Testing team (POCT) is experienced in maintenance and support of POCT equipment on wards and outside the hospital and can assist in keeping patients safe by ensuring best practice is observed when testing near to the patient. We offer training and external quality assurance schemes for blood glucose and pregnancy tests performed in primary care. A comprehensive courier service to outlying clinics and surgeries ensure the rapid transport of pathological specimens to the main laboratory. The L&D Pathology Service has adopted a new blood collection system to bring it in line with other pathology departments around the network. A The Vacuette Blood Collection System from Greiner Bio-One UK Ltd has been chosen. This new system can collect blood samples simply and safely while the new tubes enable a more consistent ‘draw’ of blood to ensure the right volume is taken. The cap colours in the new system are standardised to meet recent guidelines (see selection chart pdf below) and all fill volumes have a clear level indicator on the labels. The ICE system will be updated to reflect the collection bottles to use. There will be an initial 2 weeks supplyof the new blood bottles to be sent to each GP surgery from 18th March 2019. 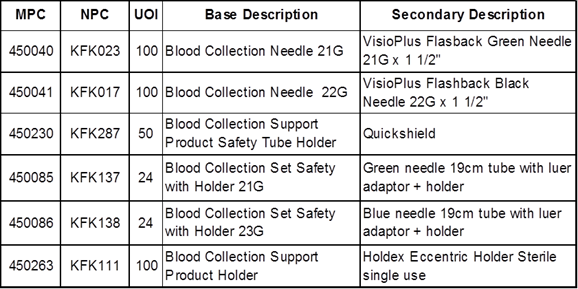 Current versions of collection needles in use are not compatiblewith the new system. New patient clinics every Thursday afternoon to see patients with endocrine, thyroid, calcium and metabolic disease and lipid disorders. Follow-up patient clinic every Wednesday afternoon.